Leading Australian property group, Mirvac, celebrated the topping out of the Phoenix, the first building within its exclusive Apartments of Tullamore precinct on Tuesday 25 September. Located within Mirvac’s coveted Tullamore master-planned residential community in the suburb of Doncaster, 17 kilometres from Melbourne’s CBD and a short walk from Doncaster’s Westfield Shopping Centre, the boutique apartment development is the first within the Apartments of Tullamore precinct. Mirvac purchased the Tullamore site—the former fifth hole of the Eastern Golf Course—six years ago for a reported $100 million and began releasing its first “8 Edition” homes valued at $1.85 million in May 2015. All 325 lots in the 47-hectare development were quickly snapped up. 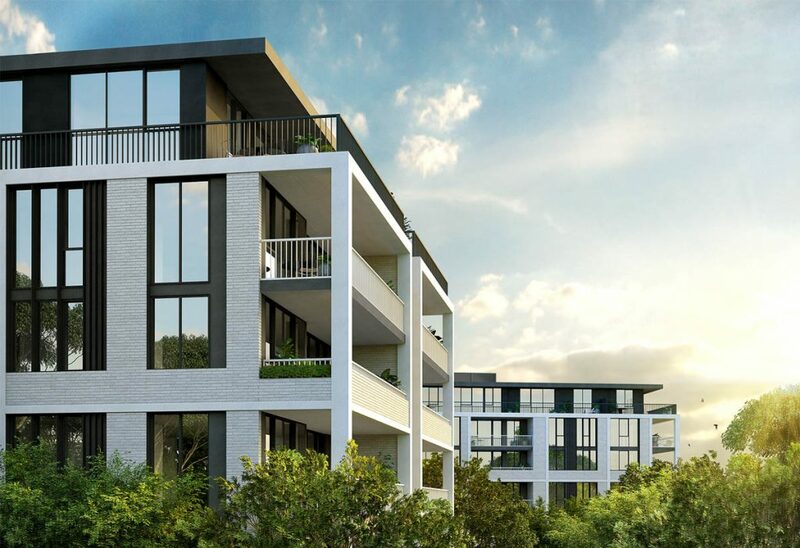 The Phoenix development, which boasts spectacular city skyline views, is nestled in an oasis of parks and green spaces and will comprise 134 one, two and three-bedroom residences that rise five levels. The luxury, low-rise apartment development has been designed in collaboration with Plus Architecture, one of Melbourne’s leading architecture practices, with the vision of elevating and enriching the lifestyle of its residents. General Manager of Residential for Mirvac Victoria, Elysa Anderson, said the apartment development has seen high demand from lifestyle-driven buyers since launching last year. “A life at Apartments of Tullamore is very appealing to prospective residents who recognise the unique proposition offered by apartment living. They appreciate the convenience and ongoing value of a low maintenance home and they don’t want to compromise on design details or location,” she said. The topping out celebration coincides with the opening of the third and largest parkland at Tullamore. The Verdant Crescent Park, designed in collaboration with MDG Landscape Architects, spans four hectares and features a double flying fox, dual slide tower, exercise equipment, shared path for bikes and pedestrians, and a dedicated barbecue and picnic area complete with rotunda. Apartments of Tullamore residents will have access to the estimated $27 million Next Gen luxury health and lifestyle club that is planned to open in 2020 and feature indoor and outdoor pools, tennis courts, restaurant dining and creche and private spa facilities. The proposed Stables Café, forecast to open in 2020, will provide a local meeting place on the doorstep of the Phoenix for residents and the broader community. Construction of Apartments of Tullamore’s Phoenix building commenced late 2017 and completion is scheduled for 2019. A prestigious Tullamore enclave has already garnered a Six Leaf sustainability design rating from the Urban Development Institute of Australia (UDIA), and is one of Mirvac’s most sought-after master-planned communities with more than 550 lots sold to date.